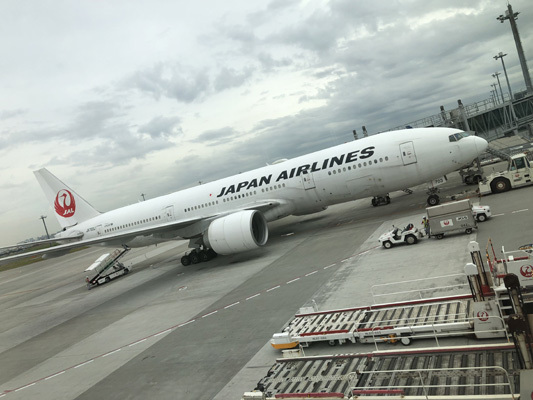 A four-star airline which allows you to feel the courteous hospitality of Japan. 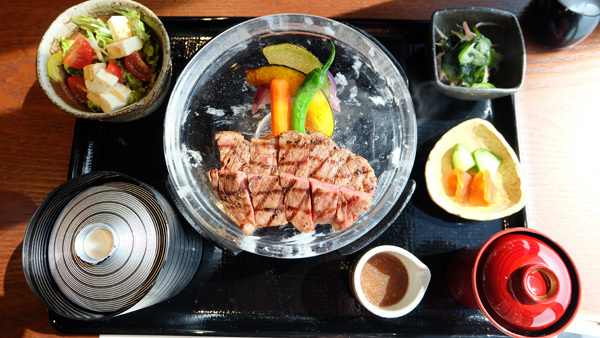 Passengers are delighted by its in-flight meals which include salads, soba, miso soup, sake, and even Häagen-Dazs. I flew from Haneda Airport this time. I recommend it because it is closer to the center of Tokyo than Narita, shortening travel time. It was convenient, because I could flexibly choose my departure day. It has been recommended for travelers traveling from Tokyo to sightsee in another region for the first time, but Thai travelers are not well aware of the availability of regional-specific JR passes. A particularly good point is that they can be used for sightseeing not by members of package tours, but by individual foreign tourists. I used the pass to travel using public trains, busses, and taxis instead of tour busses. 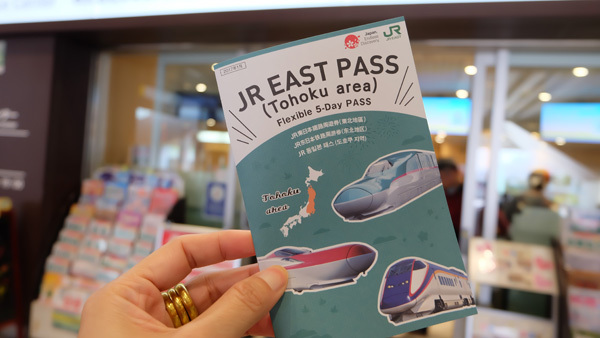 A JR Pass, which we can use to ride on both conventional rail lines and the Shinkansen trains operated by the JR, is one way to tour Japan. 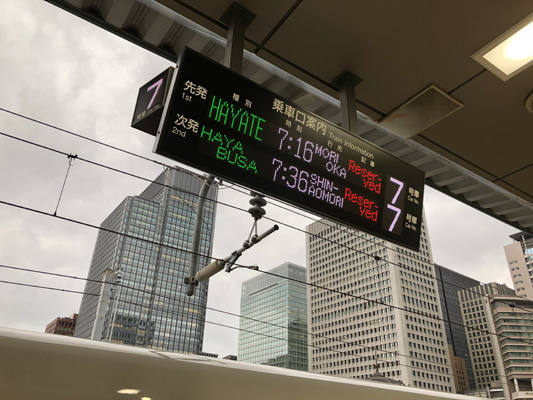 A JR East Pass (Tohoku region) can be used on JR lines, Shinkansen lines, and on the Narita Express that runs from Narita Airport into central Tokyo, and on the Tokyo Monorail that carries passengers from Haneda Airport. It is extremely easy to use. 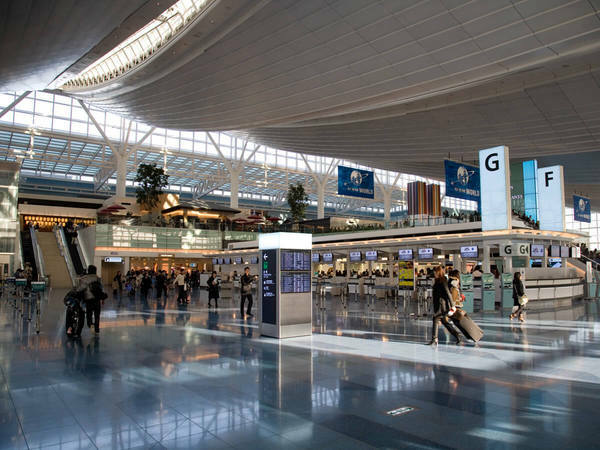 The first time, you just show your passport to the staff, then when you want to board a train later, you do not have to go to the station ticket counter; just show the pass as you enter at a manned ticket gate. I had heard or seen the name of the place, Kichijoji, several times in movies or comics, but I actually did not know what kind of place it was. 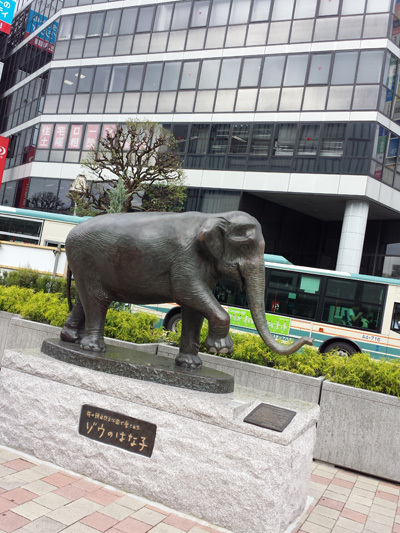 I think that Thai people have heard of Kichijoji and Hanako the Elephant, but it is likely that they don't know that the bronze statue of Hanako is in the Kichijoji Station Plaza and that the Ghibli Museum is in Kichijoji. I was delighted that I could visit them on this tour. It is easy to get there from the center of Tokyo. The zoo and the Ghibli Museum which are both a little distant from the station are externally extremely beautiful and I enjoyed looking at them from the outside. 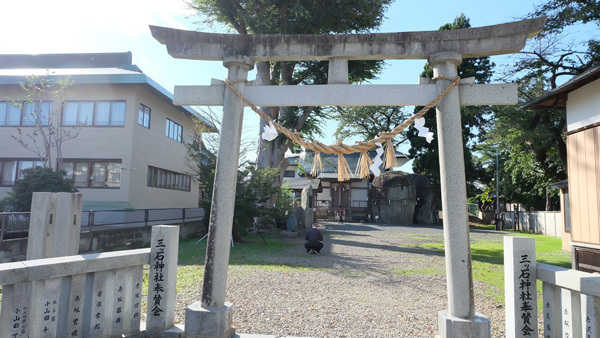 I think that if you have a chance to visit this area, you will find it interesting to just walk around Kichijoji. Japanese style steak at KISSHO KICHIJOJI, which was the highlights of this tour, was extremely delicious. I enjoyed polite service in a private dining room. I was impressed by the sight of steak being served on glass dinnerware. It is a difficult place to find, but I wish to recommend to people who want to enjoy a lunch in a peaceful atmosphere. It is a secluded restaurant known to insiders. 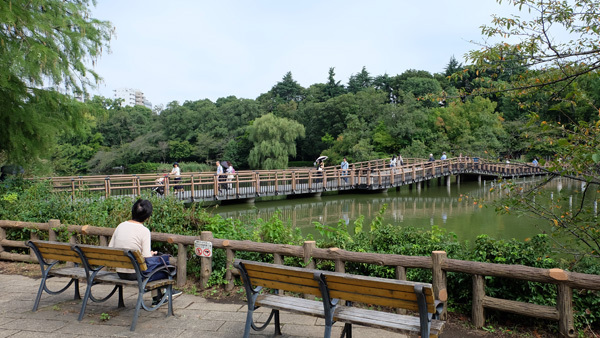 If you walk for about 10 minutes from JR Kichijoji Station, you reach Inokashira Park. 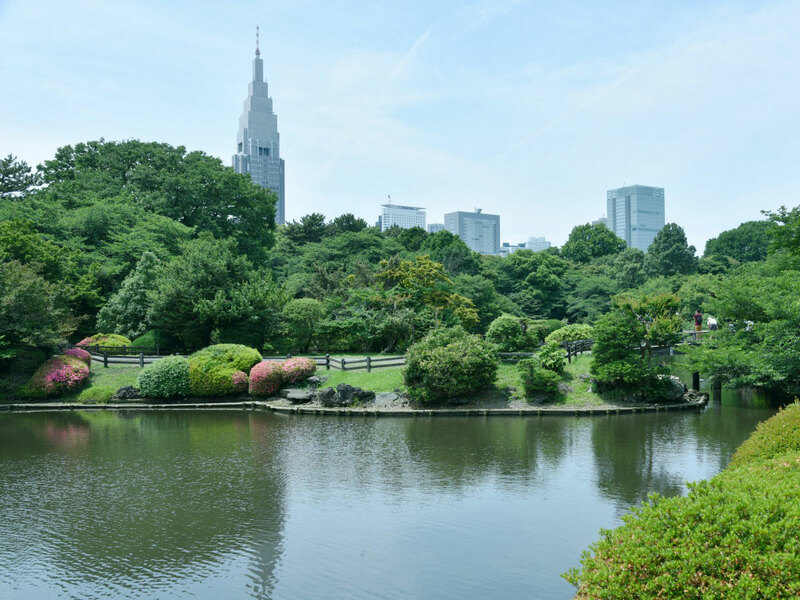 This park is an old park that opened in Tokyo in 1917 and celebrated its centennial in 2017. A zoo is now located inside the park. 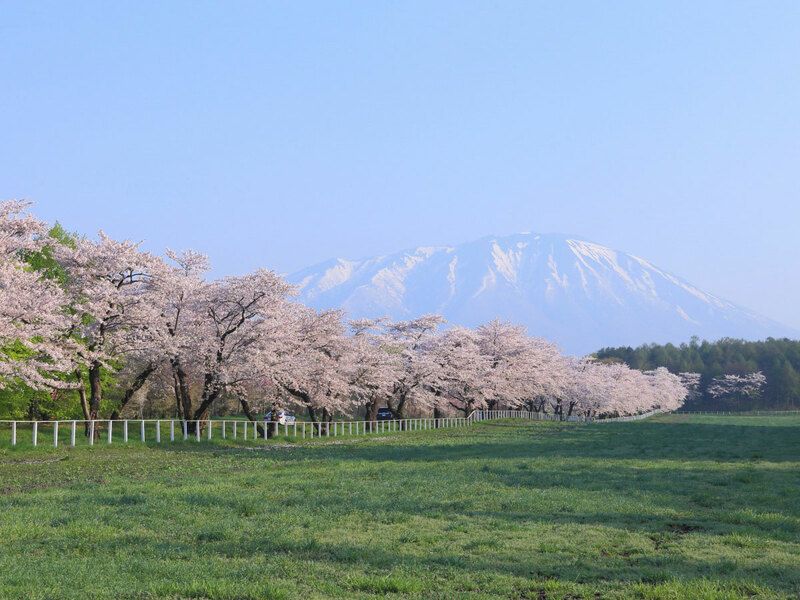 In the spring and autumn, it is a popular site that both local residents and tourists visit to see the beauty of the many blossoming cherry trees or the red leaves of the trees. It is also the site of the Ghibli Museum, which is a museum featuring the adorable animations produced by Studio Ghibli. 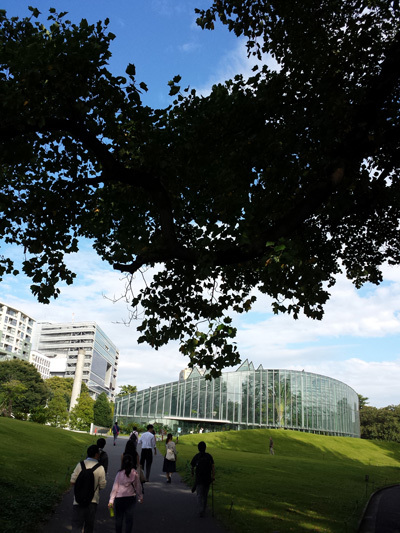 Inside the park, people stroll, sit, or enjoy the outdoors in a pleasant atmosphere. On your way back, you can visit the Sun Road Shopping Street near the station. It is the site of stores, restaurants, pharmacies, and shops selling local sweets, making it very popular among people who enjoy shopping. There are also shops handling western apparel and other fashion products. This restaurant serves Japanese food. Its main dishes are meat and shabu-shabu. 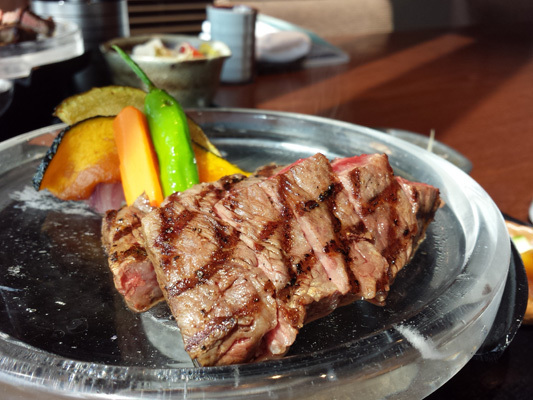 Its lunch menu is steak and side dishes. Japanese cuisine appears to be works of art that are also fun to look at. This is cuisine that is not only intended to be eaten, but can also be enjoyed visually. It tastes good and lets you enjoy the texture of each of its ingredients. This is a district constantly bustling with shoppers among brand-new buildings. I thought that if I had extra time, I would like to make a video of the Scramble Crossing. A sightseeing district with an image of a town that never sleeps, and where I seem to see a new store every time I go there, I recommend it to fashion fans. I also visited the roof of Shibuya Hikarie. Up there, the view seems to change with the weather, so I hope to visit it at different times. When you walk out of the Hachiko Exit of Shibuya Station, you immediately see the Hachiko commemorative statue. 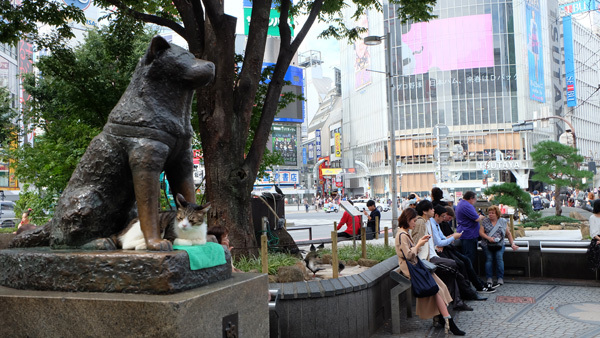 Many of the sightseers who pass this place stop and have a commemorative photograph taken of them with Hachiko. A tourist information booth stands opposite Hachiko. It is an old green railway car that the Japanese people call the “Green Frog”. The Green Frog is now used as a tourist information booth. 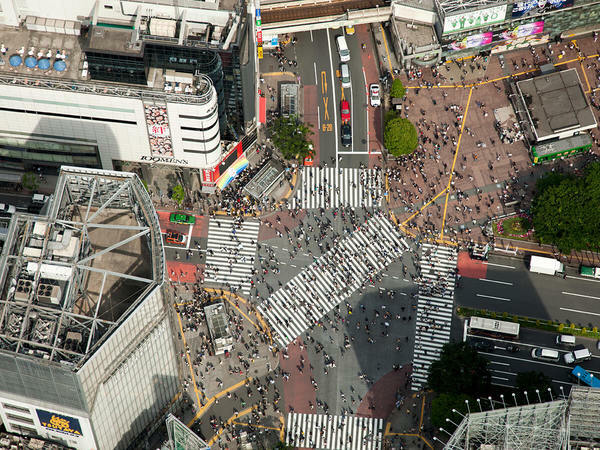 Another feature of the site you must not miss is the Shibuya Scramble Crossing used by people throughout the day. Many people cross it and the sight of them waiting for the signal to change is now world famous. When you cross the road from JR Shibuya Station and enter the narrow street to the left of Starbucks, you are on Shibuya Center Street. Brand products from Europe, America, and Japan are concentrated on this street. This district is crowded with people almost every day. At night in particular, night clubs and pubs are open for business letting people enjoy Tokyo’s night life. You will see shops of various kinds as you walk on this street. There is another fascinating place on another side of Shibuya Station. It is a department store called Shibuya Hikarie. It is more than just a department store. On the eighth floor, there is an art gallery and observation deck, both admission-free. The observation deck is open to the public and anyone can visit it without charge. I had visited Shinjuku many times, but I didn’t know about this large park near the station, I now know that it is more than just a shopping area. I now tell my friends that it is not just a place for shopping, but is surrounded by various kinds of parks. During the daytime in particular, it is a very pleasant place that you can be to bath in sunlight. It would be a serious mistake to think of it as just a park; considering its features, its admission fee is a big bargain. I have dined in the Shinjuku Golden District and on Omoide Side Street several times, but I want to introduce it as an obscure spot in Tokyo. I think that if you can, you should go to such shops accompanied by a Japanese person. Its menu lists many folk dishes that you have probably never seen before, but which are foods that Japanese commonly eat, so I can recommend it as a cultural experience. It is a spot totally different from normal sightseeing areas. This is a restaurant with an atmosphere that is welcoming even to foreigners, it is open round-the-clock, its prices are reasonable, and its food tastes good. 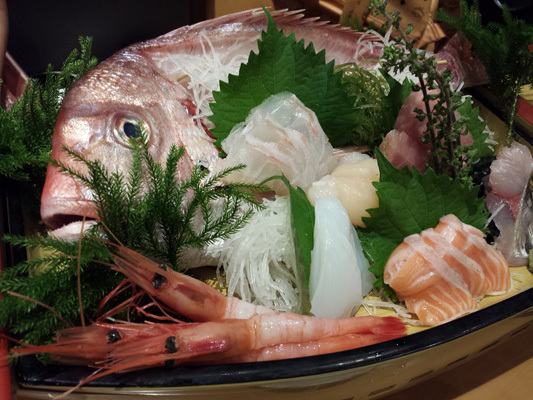 It has a huge menu including many dishes in addition to sushi and sashimi. 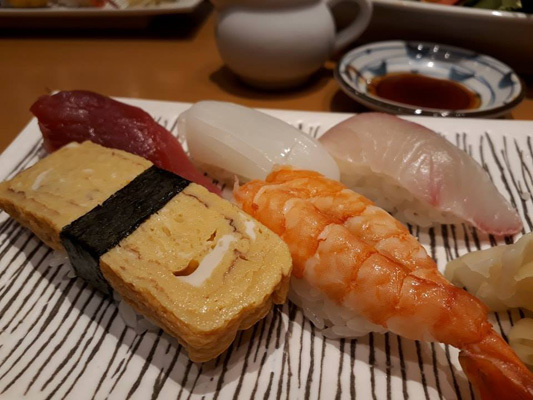 I was delighted that they considerately place photographs in the menu so that even foreigners who cannot read Japanese or who do not know much about the ingredients of sushi can order without any difficulty. 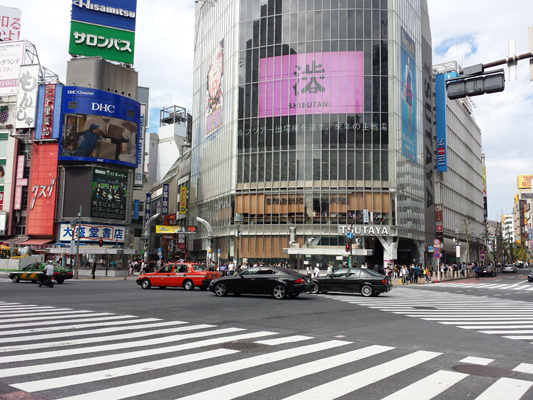 Shinjuku is famed as a shopping area. 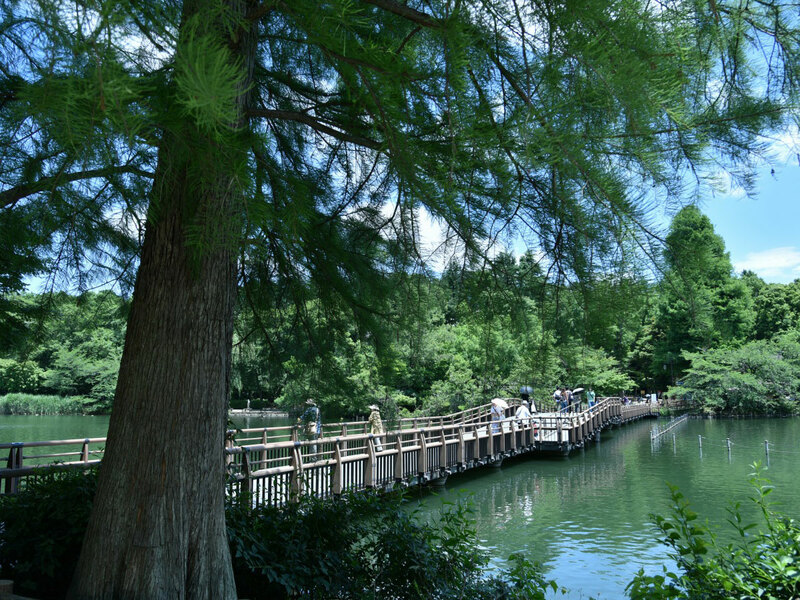 Many tourists do not know that there is also a large park in Shinjuku. 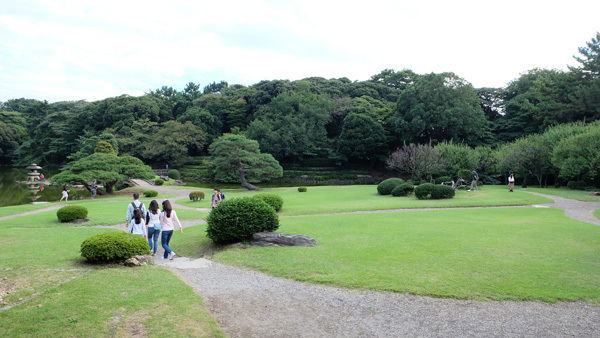 Shinjuku Gyoen National Garden is a park created during the Meiji Period (1867 – 2012). Formerly the site of the mansion of a regional feudal lord, it was eventually opened to the public. On days when the weather is good, large numbers of people enjoy it in their own way. 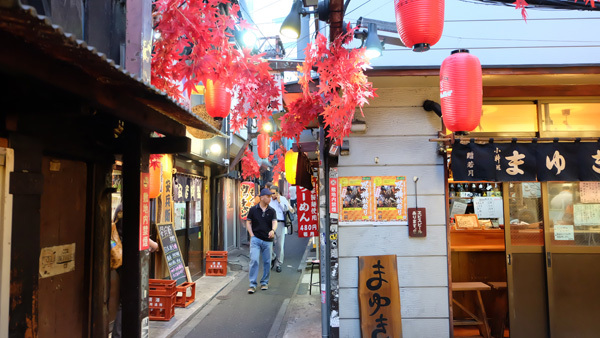 Omoide Yokocho, a row of small shops featuring a nostalgic atmosphere, is on the west side of Shinjuku Station. 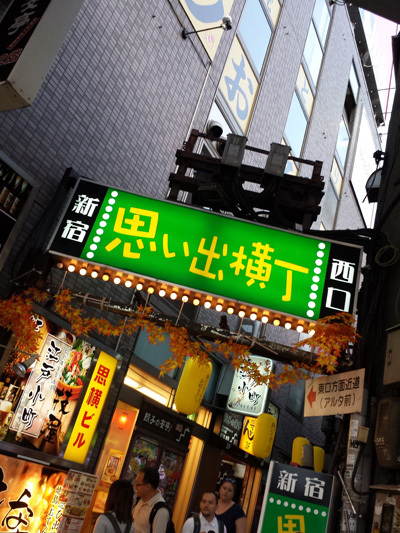 Small Japanese style bars called izakaya stand on both sides of this side street. The basic dishes on this street are easy-to-eat skewered food served with sake. Examples of this are skewered grilled beef, grilled port, grilled chicken, and grilled beef or pork entrails. These stores boast histories going back to the years immediately after the war. Sushi served by Sushimamire is fresh and very good tasting. Its menu includes a variety of dishes; not only one-plate meals and sets. You can choose to sit at a table or the counter where you will experience a sense of privacy. 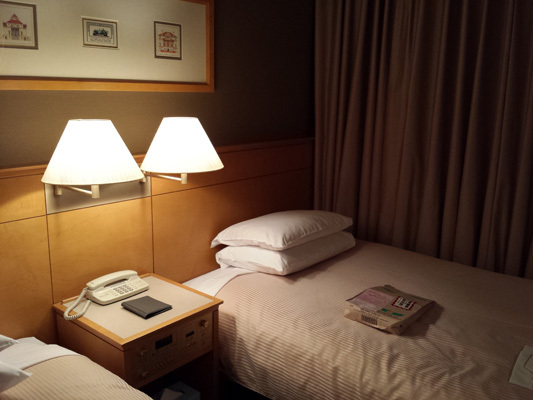 This hotel was near a popular shopping area including Don Quijote, Bic Camera, Isetan etc. conveniently located close to a station. 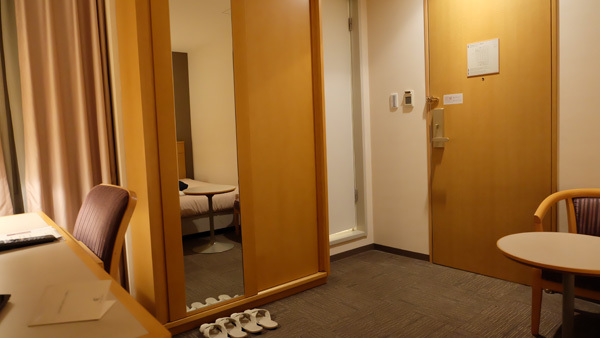 The guest rooms are wide and pleasant with a Japanese atmosphere. On every floor, beverage vending machines offered a good selection of drinks. I was even satisfied with the hotel room rates. This hotel is extremely convenient. 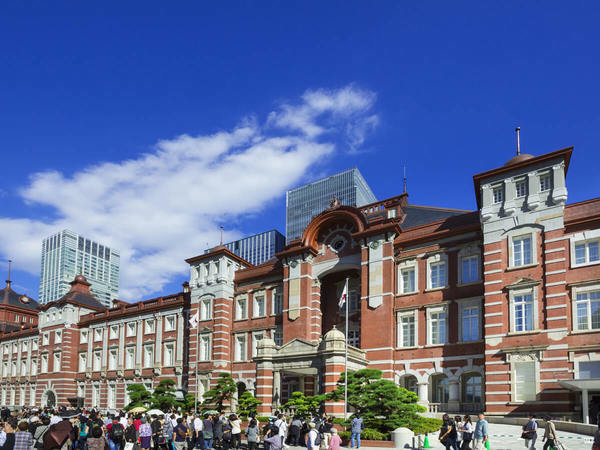 It is about a five-minute walk from the east exit of Shinjuku Station. It is probably the perfect place for people who love shopping to stay. As soon as you leave the hotel you will be impressed by the wide variety of shops you will see. The rooms are wide, actually wider than any business hotel I have ever stayed in. I always enjoy choosing station box lunches, and I think I will write an article just about station box lunches. I enjoy selecting station box lunches, but I truly felt the unique appeal of Japan once when I was eating a station box lunch while gazing at the constantly changing scenery from the train window of a Shinkansen. Few foreigners try station box lunches or select their side dishes, so I want to tell more about their charms. I think that station box lunches are visually appealing cultural feature of Japan not seen in any other countries. In Japan, box lunches sold to railway passengers in stations are called ekiben (station box lunches). The attractive feature of station box-lunches is that each station has its own unique type. 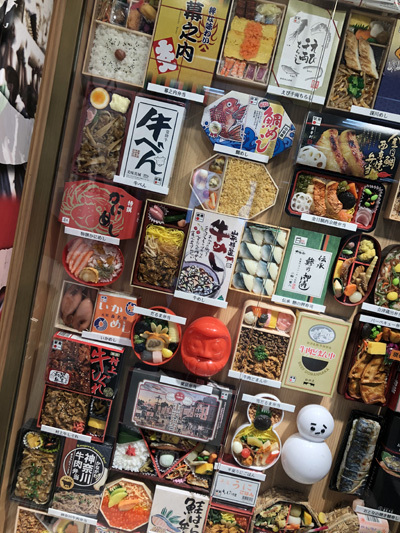 The interesting feature of station box-lunch shops in Tokyo Station is that they sell famous station box-lunches from various other regions. 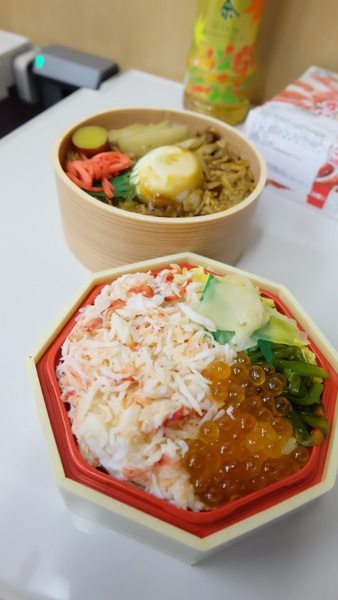 The types of box lunches sold in stations also vary according to the season of the year. The Shinkansen trains travel at high speed, and every time I ride one, I am surprised by the cleanliness of its interior. And the JR East Pass (Tohoku Area) makes it extremely easy to travel by Shinkansen. A JR pass seems quite expensive, but users can actually ride at a discount, even on the Shinkansen. And it saves them the trouble of buying a ticket every time they travel. Many people still do not know about them, so I would like to urge you to be sure to purchase one. 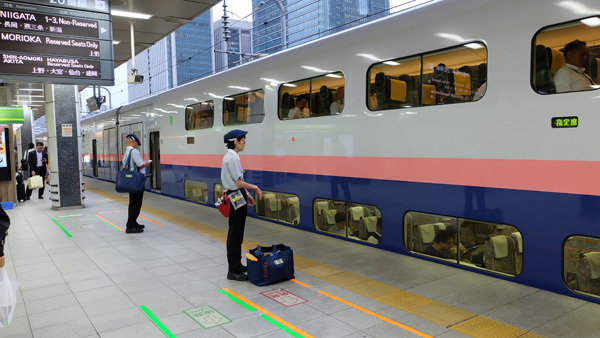 Riding the Shinkansen is one method of travel that tourists can select. It is particularly beneficial for a person with a JR East Pass. The seats are comfortable and wide and there are places where they can stow their luggage. Here, I felt like I was seeing a view of heaven. The view seems to change according to the season, and I wanted to visit at various times. 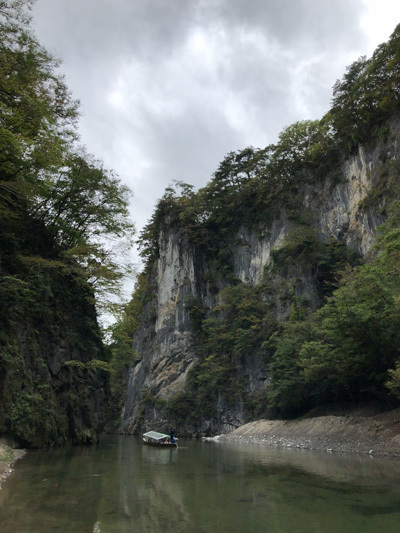 I personally liked Geibikei Gorge where I could gaze upon ancient scenery of Japan while riding on a boat. It was a very cold day, and the warm kamameshi was so delicious it deserved to be called a “masterpiece”. I would like to visit the gorge again during the snowy season. It was raining this time, but this too was fantastically beautiful. 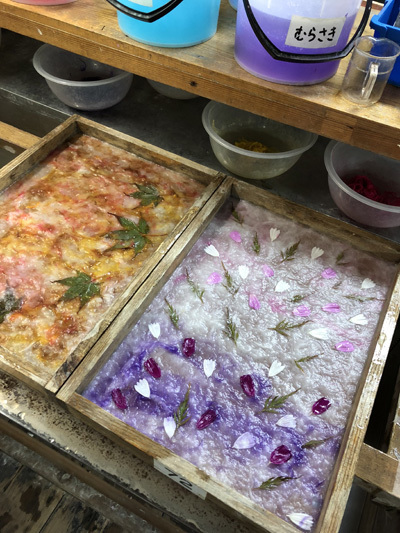 The paper-making experience was novel and fun. Hearing that it takes as much as a week for the paper to dry, I was impressed by the artisanal spirit of the Japanese people. I was able to enjoy it without anxiety as the staff strove to politely explain it in English. I was able to have it mailed overseas by paying the postage. 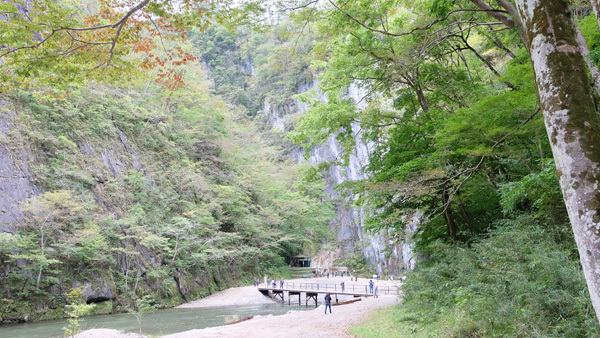 Geibikei Gorge has been selected as one of Japan’s leading 100 scenic sites. The river flowing through the gorge is about 1 meter deep, but its water is extremely clear. There are fascinating stories associated with every point that a boat passes as it travels through the gorge. The captain of the boat explains these to their passengers. 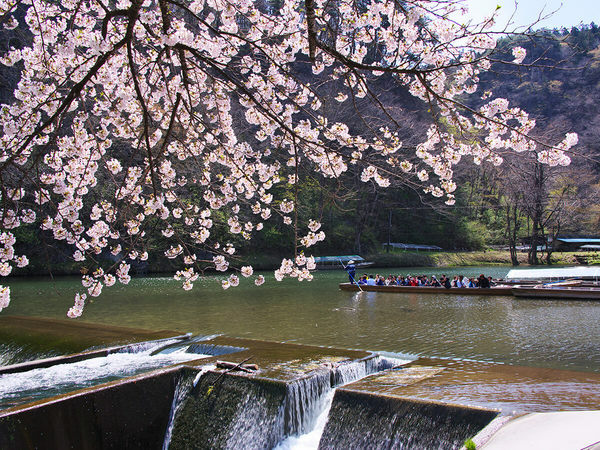 You can take a boat tour through Geibikei Gorge in any season of the year. You can choose between boat tours with and without lunch included. Each boat tour is a two-way tour taking about 90 minutes to complete. 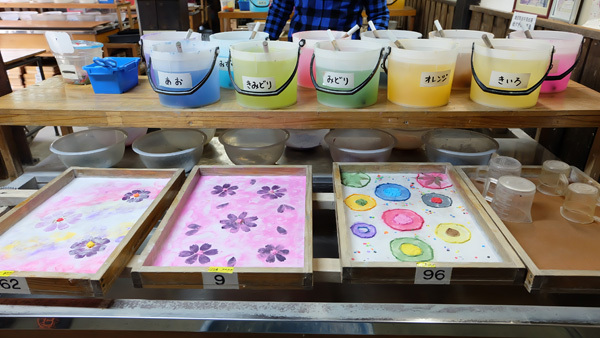 Another enjoyable experience near Geibikei Gorge is the paper-making experience. You make paper and decorate it with flowers or greenery. After you have decorated it to your heart’s content, it must dry for about one week. Leave your address with the shop and it will mail the paper to you after it has dried. This is the site of a beautiful temple and group of historical remains so large that it took me a whole day to see them all. 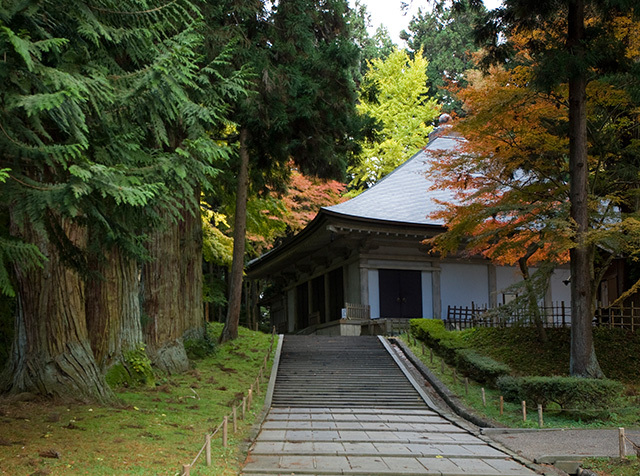 Historical Hiraizumi is the site of the Konjikido Golden Hall of Chusonji Temple and many other registered world heritage sites. Now many foreign travelers come to this sightseeing region. Photography is forbidden in parts of the interior of the temple which are seared into my memory. The pathway to the temple is a little steep and difficult for elderly people, but I thought it was good place to learn about Japanese culture. I was able to enjoy climbing the path with young sightseers, leaving me with delightful memories. 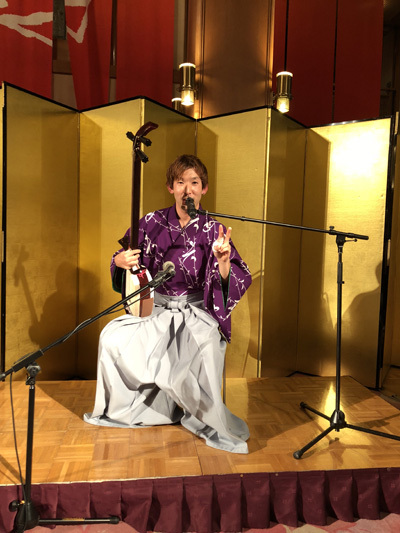 The first time I heard the samisen, I was astonished that it was possible to create such beautiful tone colors with only three strings. I could actually try playing it and had my picture taken with the performers. 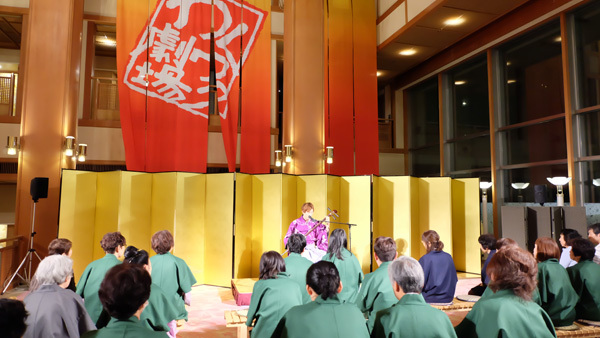 It seems performances of other traditional instruments in addition to the samisen are presented here, so I hope to actually hear them during my next visit. Chusonji Temple is a very important temple. After I started to climb up to see the Konjikido Golden Hall at Chusonji Temple, I reached a row of beautiful trees. 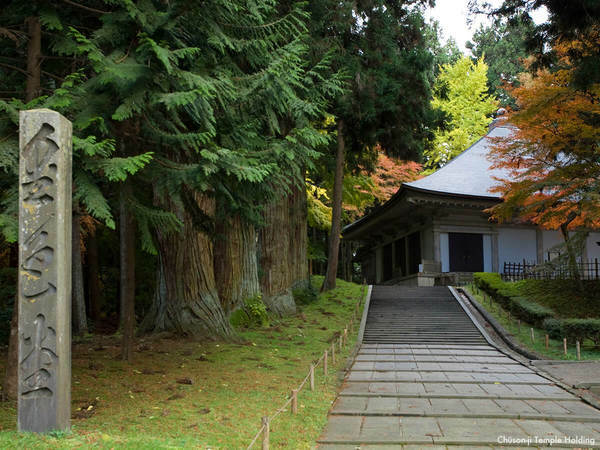 The major attractions at this temple are Konjikido Golden Hall, Fusatsudo Hall, the Treasure House and the Chusonji Sutras. It is a stringed instrument with 3 strings. 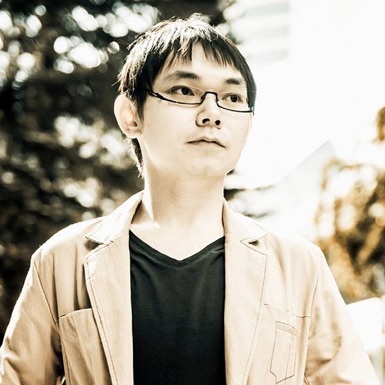 When you listen to its performance, it can create such extremely delightful music that it is impossible to believe that it has only 3 strings or that it is played by a single person. I was astonished the first time I heard it played. This hot spring was developed with water taken from Dai Onsen in 1923. The cherry trees and red pine woods, and the rose garden with a flowerbed sundial designed by poet and author Kenji Miyazawa, create an elegant and calm atmosphere. 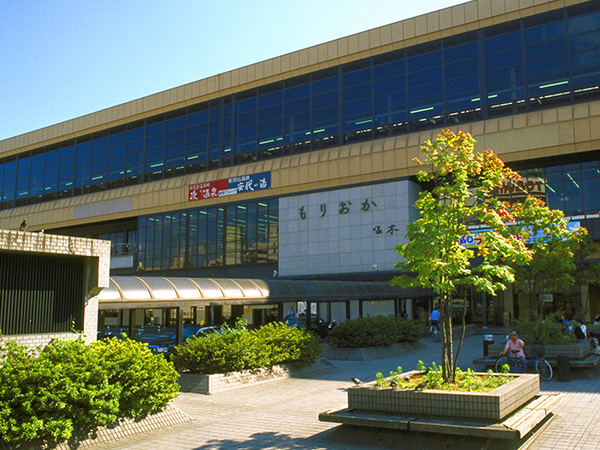 Hanamaki Onsen is widely known in Japan as a hot spring resort in northern Tohoku. The water of the hot springs is beneficial for rheumatism and neuralgia. I spent my time quietly and peacefully, completely different from Tokyo. At a ryokan at Shidotaira Hot Spring in Hanamaki Onsen Town, I was moved by the great taste of Kaiseki cuisine made using seasonal ingredients, and savored the pleasure of drinking sake while enjoying the sight of the scenery surrounding the hot springs. The guest rooms were wide, the toilets and baths were separated, and I felt that the service was courteous. The next morning I was served Japanese cuisine which I ate with relish. I was impressed by the fact that although it was a regional ryokan, it provided plenty of electrical outlets to consider the needs of modern sightseers who bring smart phones, tablets, PCs, and cameras. 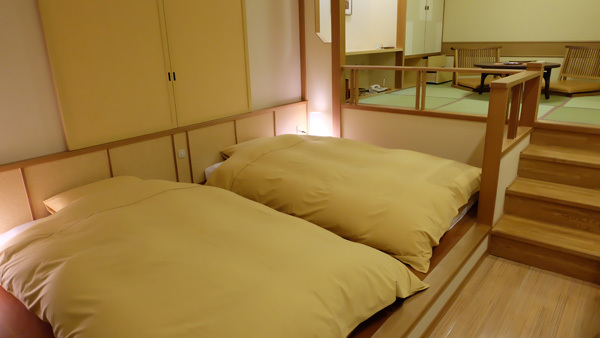 This lodging at Shidotaira Hot Spring in Hanamaki Onsen Town offers both western style rooms and ryokan type rooms. Inside the rooms, they seem beautiful, spacious and comfortable. In the rooms where you sit and relax, the tatami create a Japanese mood. In particular, in this ryokan, there is a hot spring bath attached to every room, freeing you from the need to endure the embarrassment of using large public bath. 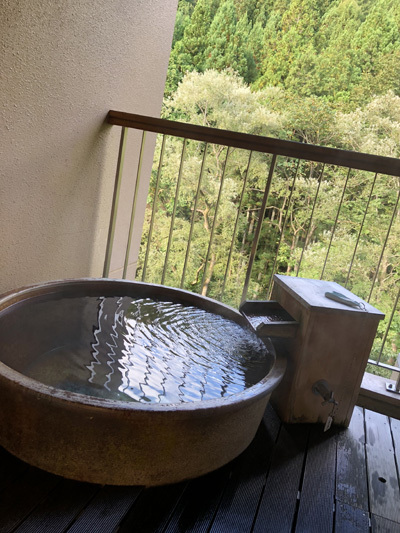 Each room not only has its own bath, it offers a view of conifer forest outside the rooms and the ryokan is quiet, allowing you to constantly hear the gurgling of a brook. The evening kaiseki meal and breakfast as well as eating in your room is a delightful one. With many attractions giving tourists experience of local culture, it is perfect for sightseers who travel as couples or family groups, and on the farm, I enjoyed cuisine prepared with fresh ingredients. The Koiwai Farm seems to be far, but direct buses depart regularly from Morioka Station, so it did not feel inconvenient. 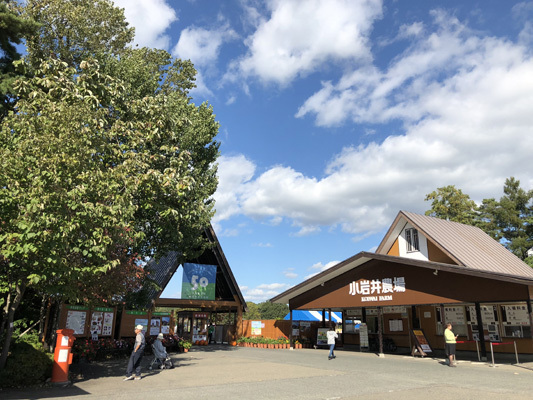 I had seen Koiwai Farm milk many times in supermarkets, so I was happy to be able to visit the ranch when the weather was good. The sight of the fluffy forms of sheep running at a dog and sheep show was particularly charming. I was able to tour a factory that manufactures milk and cheese, and to actually taste its products. A fee-charging bus travels the fields for the use of busy people and people who have difficulty walking, so it was easy to move around the farm. This farm is famed for its delicious milk, butter, and cheese. 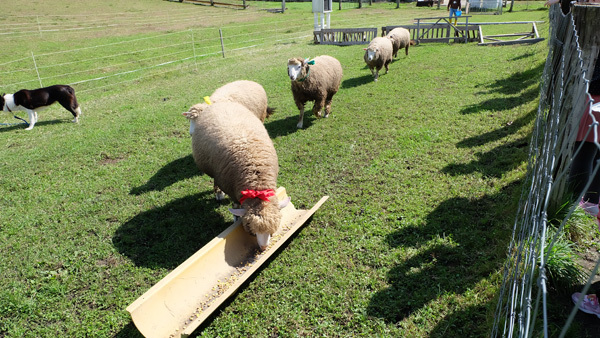 The farm fields are broad and the sheep-and-dog show is charming and delightful. There is also a cosmos field nearby. With Mount Iwate visible in the background, it was extremely beautiful and vast. There is a restaurant on the farm serving lunch sets accompanied by delicious milk. 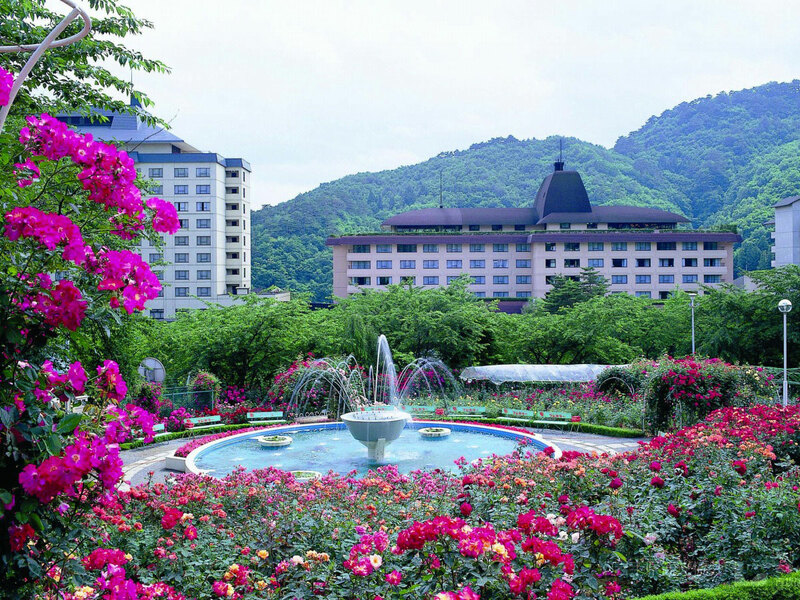 Morioka provides as wide a selection of amenities as Tokyo, as you would expect as the center of Iwate Prefecture. But I was able to spend a more relaxing time than I could have in Tokyo. Wanko-soba, which means mini-servings of soba, is served here, and I definitely want to try it on my next visit. I also saw a place called wanko-road, where soba characters gather. There are many places to stroll in Morioka. 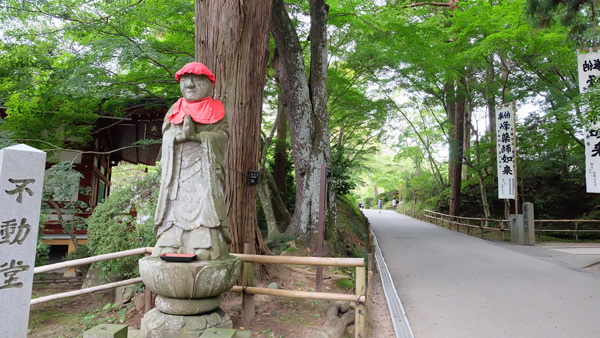 It is also the location of historically interesting shrines and temples. The Demon’s Hand Prints” at Mitsuishi Shrine which I visited are giant stones traditionally said to near the handprints of giants. There is also a temple said to be historically extremely important. In this temple, which is called Hoonji Temple, you will see images of arhats, which are Buddhist monks who have attained Nirvana, made of pine wood. You can see about 500 on display in the Fusatsudo. 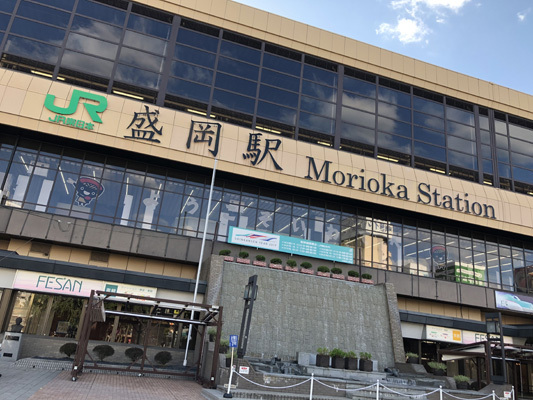 There is also a department store connected directly to Morioka Station, where you can enjoy shopping in the rows of stores and restaurants. Do not forget to try out one of its famous station box-lunches. 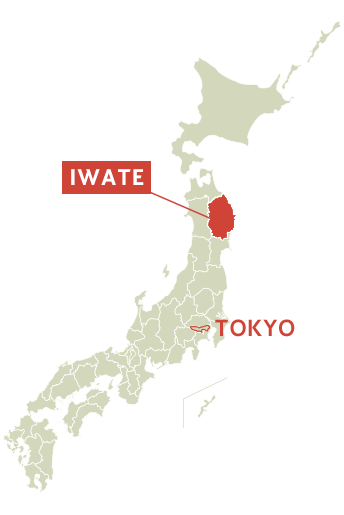 Looking back at my trip, I had succeeded in encountering the unknown charms of Japan, and hoped to someday visit Iwate. I was able to enjoy Japan even more with the guidance of the people of the region. 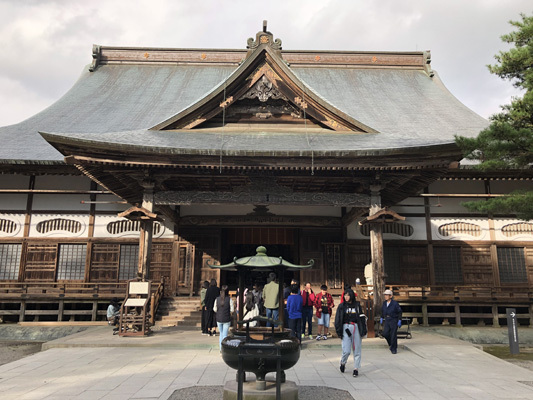 It was not a tour limited to simply taking photographs of famous sightseeing regions, rather it was a significant tour that allowed me to experience and enjoy the characteristics of Japan by visiting the region. This was a very exciting trip. I say this because it was a chance to visit many places in Tokyo that I had never heard of, even Omoide Yokocho which has existed since the post-war years. The parks of Tokyo offered not only green space but many fascinating features and allowed me to learn just how large and beautiful they are. Not only that, it took me to places surrounded by beautiful natural settings in Iwate. I am eager to share all that I learned through my experience of this trip with other people who also want to come to the cities and rural areas of Japan. I took a trip from bustling Tokyo to peaceful Iwate. 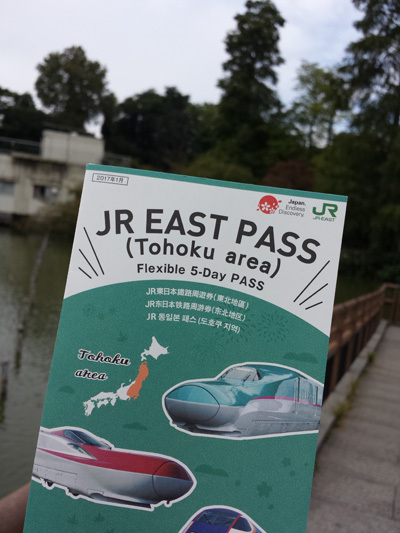 It seemed to be a very short distance because I used my JR East Pass (Tohoku Area). It includes extremely fascinating places not well known among tourists from Thailand, so it was a splendid trip and I was sorry when it ended.